This incident is not recorded in any history book. This is the only period for which I have an appropriate card deck. It was late summer in 1759 and Brigadier Murray had landed with a party of troops on the North Shore of the St. Lawrence, up river of Quebec. He learned that French troops were approaching from the south and decided to await them at Petite Ile. His force consisted of detachments from the 27th and 58th Foot, Louisburg Grenadiers and Fraser's Highlanders along with two companies of Rangers and a field piece. 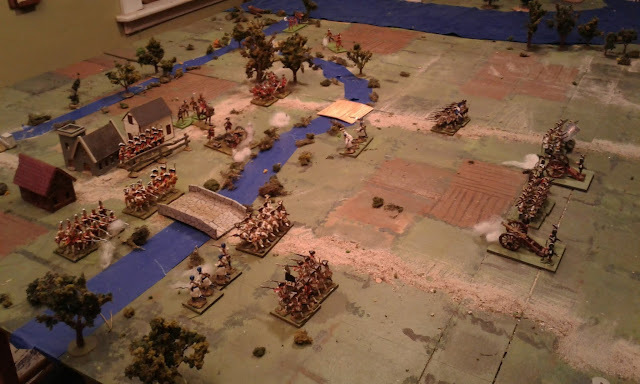 The game began with artillery and skirmisher fire against the British positions, answered by the British gun but soon the French infantry began their advance. In the far distance Indian scouts can be seen hunting for a ford. The French force, commanded by de Bougainville, had orders to protect the inhabitants but above all, to protect the string of supply depots. Knowing that there was a major cache just downriver, he decided to force his way past the British. None of the troops with him were local but he knew that many of the tributaries were fordable in places so he sent some of his Algonquin and Huron allies to scout for crossing points. To keep the enemy occupied, he decided to deploy and attack the bridges on the main road. His force was comprised of 5 detachments of infantry, mostly Troupes de la Marine, 2 parties of skirmishers, 2 bands of Indians and 2 guns. 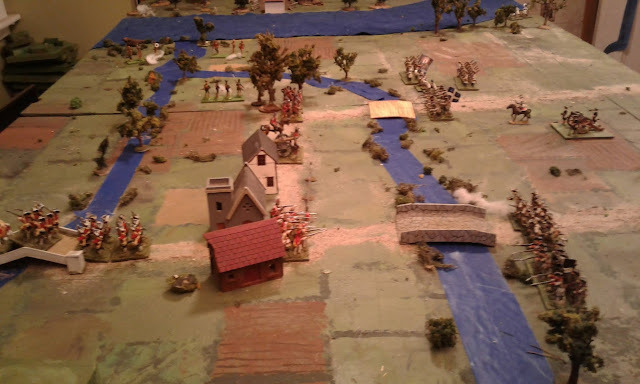 The French pinning attack on the Western bridge closes up and a long distance fire fight ensues. The scenario was again an adaptation of "Holding Action (2)" from CS Grant's Scenarios for Wargames. 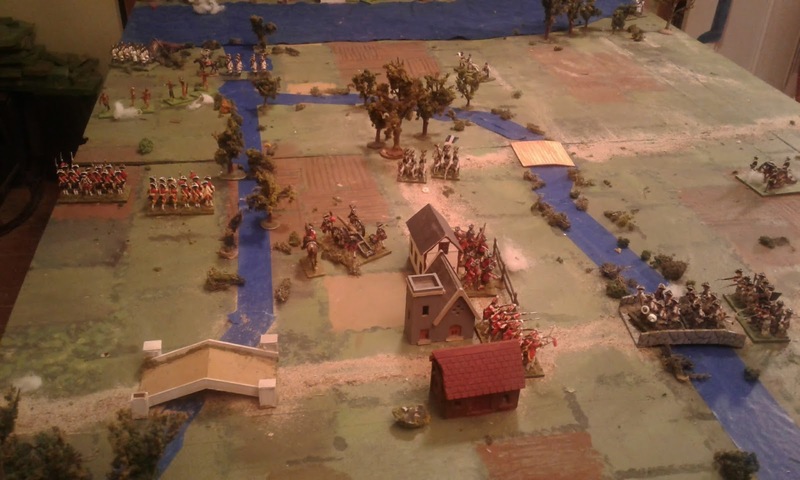 The British hold the Western bridge, repulsing 2 charges and winning the firefight. 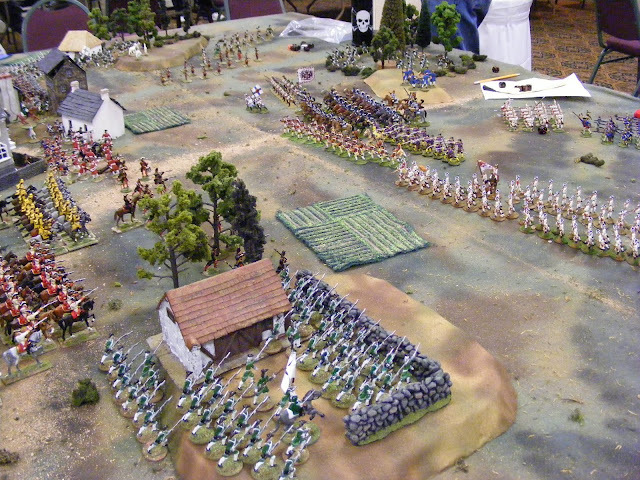 Those who have been paying too much attention may have noted that the preview showed 30mm European armies on the full 4'x6' table but that here we have a 30mm French & Indian War game on a 4'x4' board. All will be revealed next year. General Murray, alerted to the Indians fording the river and dispersing a company of Rangers, and noting the French movement to their right, begins to shift half of his infantry to block the ford. 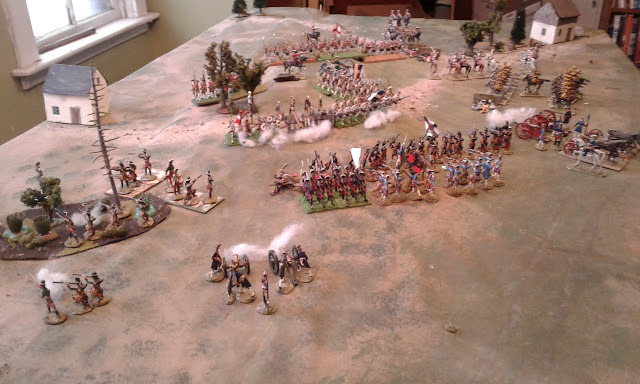 The game was played using our Seven Year's War Portable Wargame based on the Ancient version. 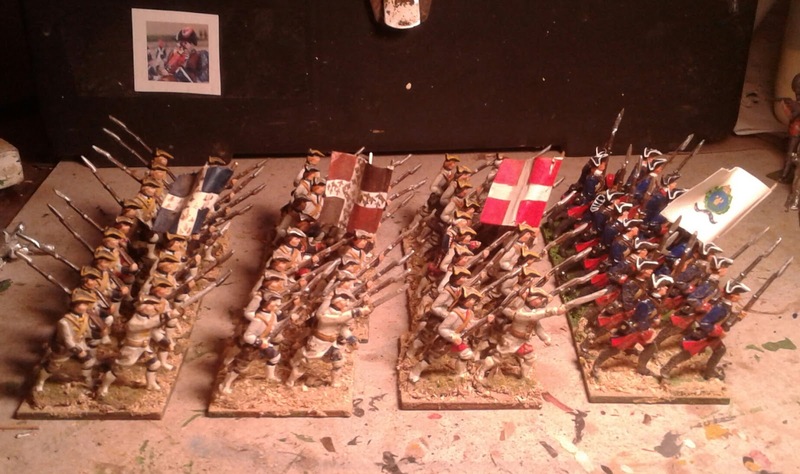 Line infantry count as "Heavy Infantry" in melee and have a range of 2. Light infantry have a range of 3 and do not suffer the -1 for fighting in woods. 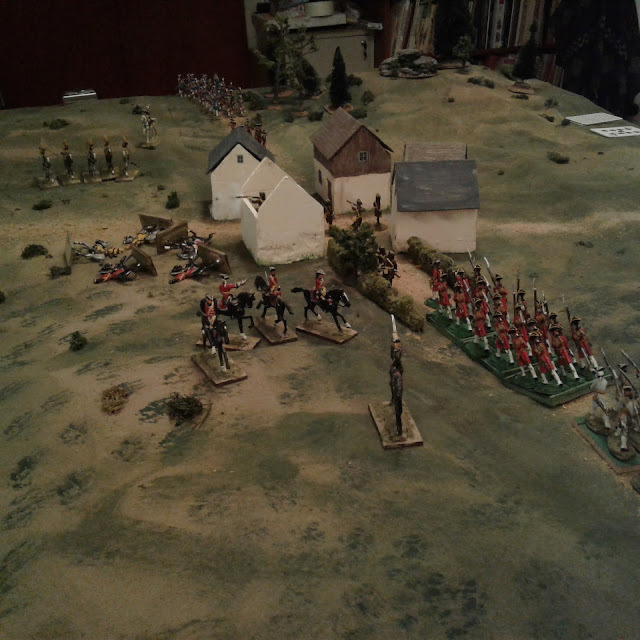 The Highlanders hold the Compagnies Franches after a protracted fight. 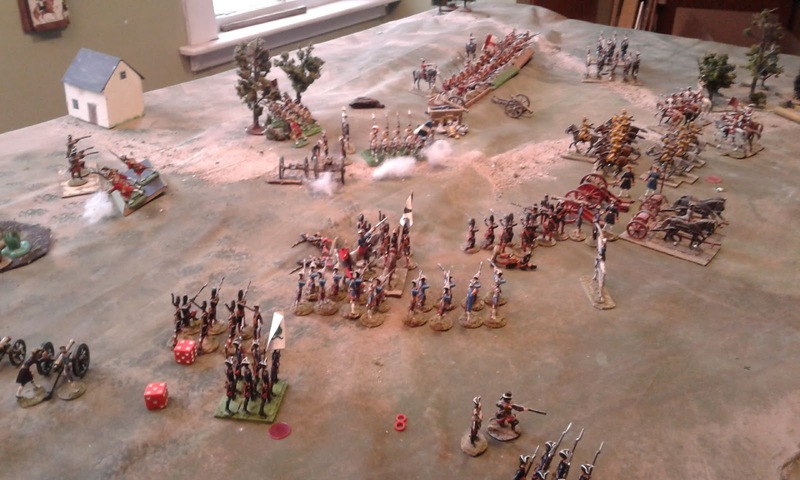 The game lasted 9 out of a possible 15 turns and ended when the British became exhausted after heavy casualties. They were not in a position to block the ford and were no longer allowed to attack. There was really nothing they could do to prevent the French marching off. It was one of those games where the British units decided that they would rather die than retreat while the French were very sensible and fell back quite often. This was of course, part of Bouganville's cunning plan, to wear the British down so they couldn't counter attack any troops slipping across the ford. The British are still holding but casualties have been heavy and Murray is forced to drop his planned counter attack on the ford. Instead, he will have to let the French pass and reembark when the fleet returns. So that is it for 2017! Thank you to all who have stopped by over the year and an extra thank you for those who took the time to leave a comment. Not only do comments help reassure me that someone besides bots are looking in but I confess that the comments even more than the viewing stats sometimes influence which games and periods get played or painted when I'm undecided. Last, but not least, an even bigger THANK YOU to those whose comments occasionally contain suggestions, observations, opinions, questions etc. Not only are they often valuable in their own right but the two sided conversation aspect helps me feel connected from my old farmhouse on the far fringe of wargaming civilization. May you all be blessed and enjoy life in 2018. Its time to think about my last game of the year. This is a new ritual since 2009 when I did my last Game of the Week on Dec 30th. (See Playing through Scenarios for All Ages). In some years there was a Gathering of Hosts last game of the year in other years it was a Battle Game of the Month last game and some years I seem to have squeezed in one of each! I seem to have gotten particularly wild and crazy as I "mature". Well, crazy maybe. Anyway, since the table wasn't fully cleared after the last game, I decided to replay it in a different period and scale. Then I tried to figure out what my "least played with recently" collection was. I came up with just one "didn't get out this year" candidate! 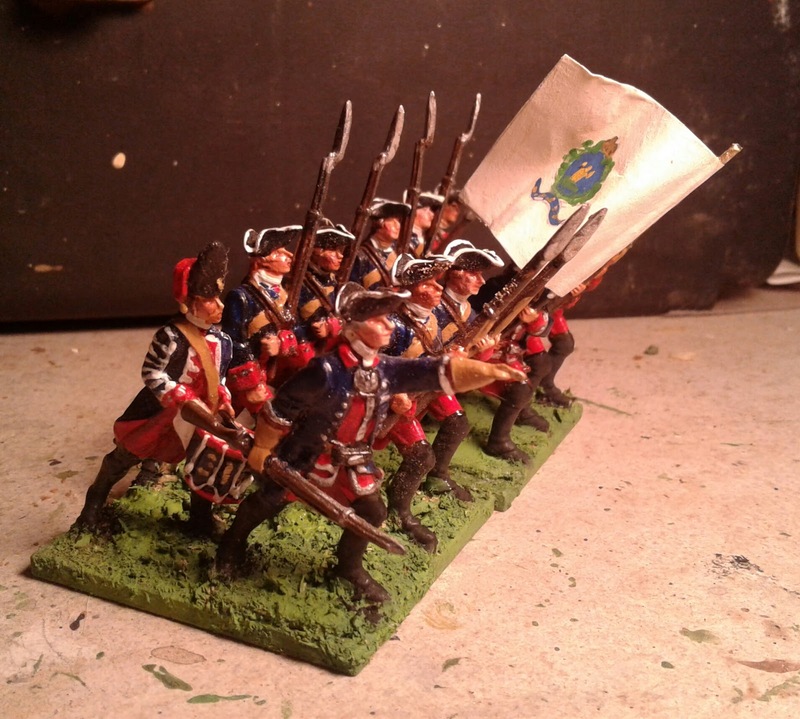 My old 30mm SYW troops! 30mm figures. I purchased these figures from Figurines Historique in 1973 after I got my copy of Charge!. 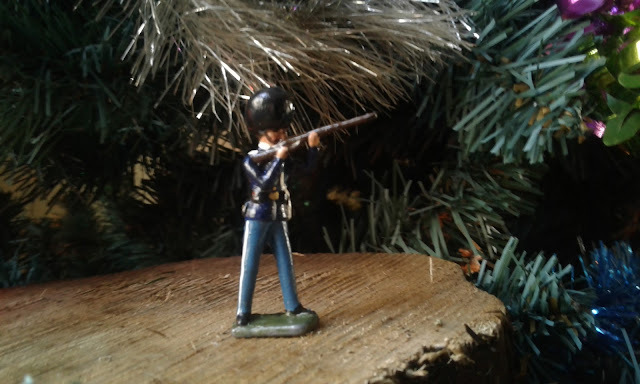 They were leftovers from a bespoke range which were designed for a diorama of the Battle of the Plains of Abraham which used to be on display in a museum in Quebec back in the 70's. They were my first metal wargaming figures. 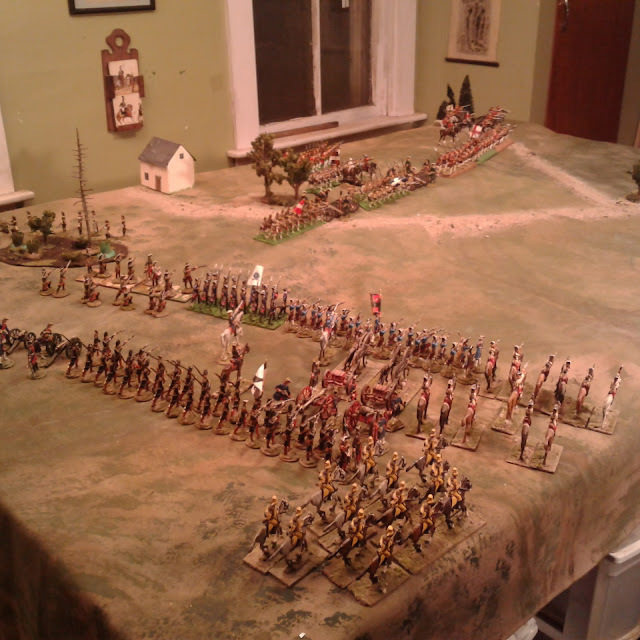 I had based these armies in 2013 for a go at the Portable Wargame with Ron. Since they were least used and Bob had published the rules this year, it just seemed an ideal combination for my last game of the year. 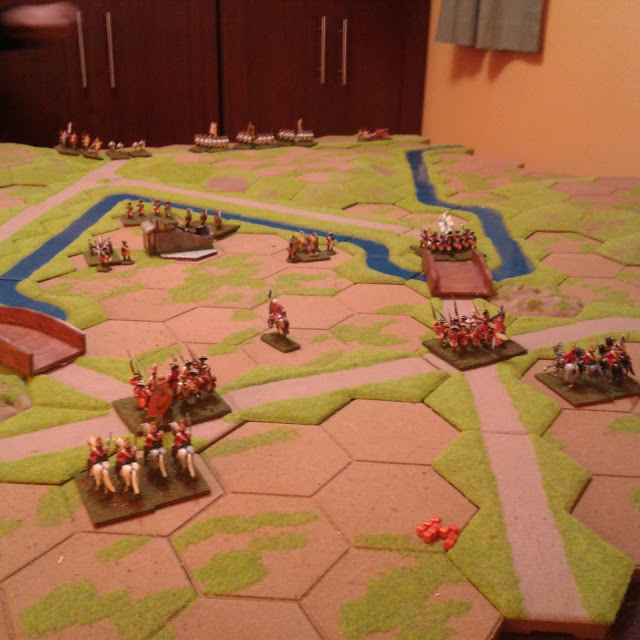 The game set up as per the scenario instructions with Red's cavalry scouting ahead in small troops. Last week I had this powerful urge to play a more "conventional" wargame with my 54mm Toy Soldiers, and no I don't know exactly what that meant either except that I wanted something larger and more complex than a One Hour Wargame. So, I turned to CS Grant's Scenarios for Wargames and picked Scenario 4, Holding Action (2), and I decided to go off the grid using Hearts of Tin, and quickly reorganized the troops into suitable units, and laid out the armies. 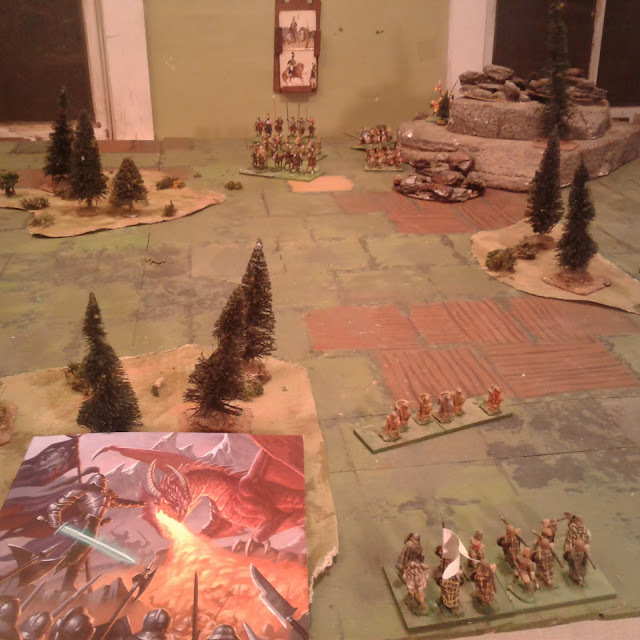 Feeling lazy, I had decided to just lay the game out on the painted table top. This was lucky since once the troops were laid out, I realized that this was still not where I wanted to go again with my 54's. So I went back on grid, rearranged the troops into their usual Tin Army units and started to play a Red vs Blue game without so much as coming up with a backstory or setting. 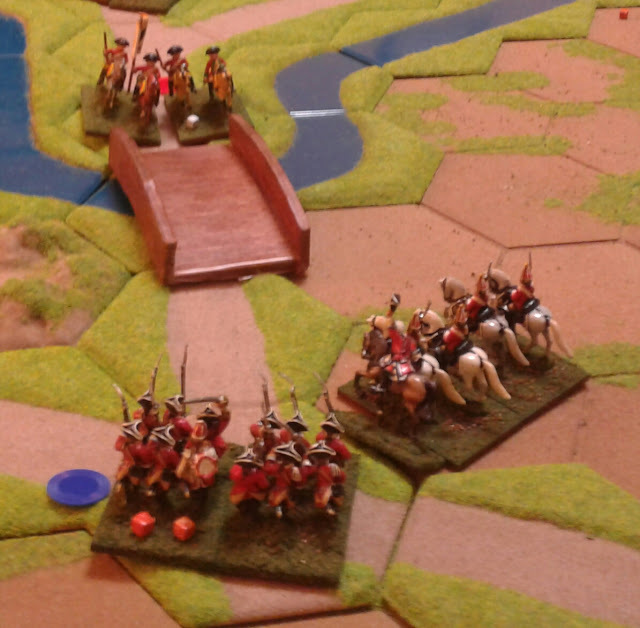 Red's cavalry crosses the ford. Behind them the assault has stalled with Red initially losing the firefight against inferior numbers of Blue infantry and artillery. Blue was tasked with preventing Red from crossing the supposedly unfordable river. With this in mind his entire force was deployed on an island connected by bridges to both banks. Red's job was to get troops across the river and off the northern table edge. 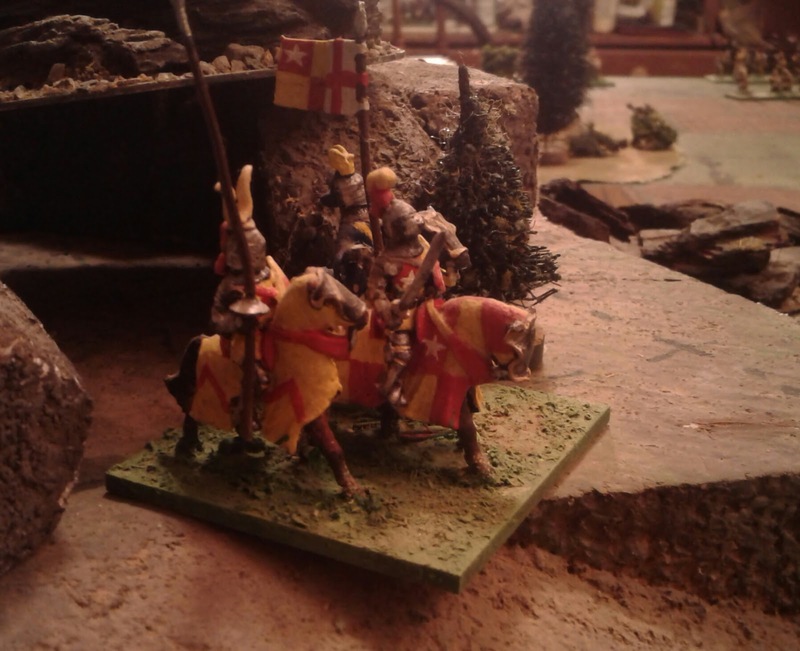 As per scenario instructions, some of his cavalry was scouting ahead to look for hidden fords. Having played the scenario several times over the last thirty something years, this called for some role playing for both sides and a die roll for Red's decision once the ford was reported. Blue redeploys his cavalry to the West bank despite a pinning attack by Red's adhoc Naval and Rifles Brigade against the Southern bridge. I had spent some time writing up some clever, only slightly convoluted improvements to the Tin Army Command Control rules, improvements which I forgot to use and didn't miss. Instead, habit led me to just dice for units to move if they started beyond command radius of their Brigadier or of the General. Simple and providing sufficient hindrance, especially when paired with the usual Initiative and Chance Card deck and a turn limit. OK, habit wins again. The Highland Brigade is redirected to move to their right to cross the ford and continue the march North. Red's plan was not terribly brilliant, unlike Blue's luck with the dice and the Initiative deck, but numbers eventually won out by a nose. To be honest though, the fighting was so intense that both sides initially forgot their victory conditions and for something like 10 turns it was a battle for control of the bridges. Then the players were reminded that the goal was for Red to move North by any path and for Blue to prevent him. This led to some last minute hurrying. A late game charge up the Western shore by Blue's two cavalry squadrons beat the three Red ones, routing one and nearly routing the shiny new Bodyguard but their own losses were heavy. Alas for Blue, his Army Morale cracked at the start of the last turn when three broken units failed to Rally, This left Red an open road for several battered companies of Highlanders to march off the Northern edge, fulfilling their victory conditions. Anyway, I had already set up the table days ago so, once the woodpile had been restocked, the phones recharged and the power was back on if not exactly stable, I set to. Apart from Holiday distractions, one reason the game had not been played earlier was that I couldn't quite decide which way to go with the 54's now that their numbers were increasing again. I initially set it up to be played off grid using Hearts of Tin but even without rolling a single die I could tell that it wasn't "right" though I would have trouble explaining why. I decided to reset slightly and go off grid with the Tin Army with the latest minor tweaks. Hopefully tomorrow I'll post a report showing what a good idea that was. For some of us the two are linked together. A Merry Yuletide Season to all. 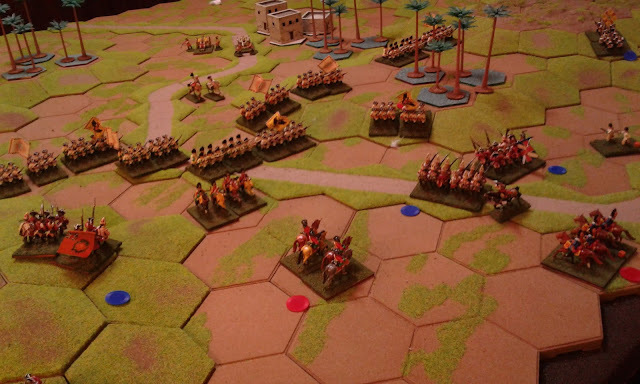 Weak Flank: Comments and a short version of the HofT rules. Just a few comments on Saturday's game and the long promised 2017 updated Hearts of Tin rules, or, the short version anyway without the definitions, options, explanations and additional troop types, terrain details, engineering, etc etc. Just a reminder of what it looked like after a couple of turns. The game was the Weak Flank scenario from CS Grant's Programmed Scenarios. 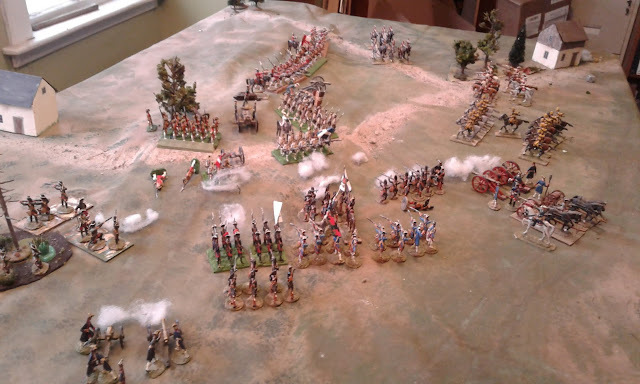 I played the Defender and, based on a cross between the job in hand and the available troops, selected a list with 2 cavalry units, 7 infantry 1 light infantry and 2 batteries. When I quailed at the thought of reducing my existing battalions to 2 stand units I had decided to reduce the number of battalions per brigade to a Grantian 2 vs my habitual 3 (based on their Charge! origins). What can I say, I forgot. So my army had 2 infantry brigades each of 3 battalions and supported by a battery, plus an independent battalion, a brigade of 2 cavalry and a light infantry unit split into 2 detachments. After checking the instructions, I placed the light infantry as a flank guard, posted behind a marsh as per a die roll. The Cavalry were given the left flank and one infantry Brigade was posted on the right while the other took the centre. Each had an attached battery. Now, a proper deployment of the time would normally have seen each brigade in a single line with a separate brigade forming a 2nd line. Well, the table was not long enough for my brigades to form in a single line but too long to be covered by 1 Brigade, so, I put one Battalion of each Brigade in reserve with the independent battalion in army reserve as per the deployment roll. For the Attackers, I rolled up a plan of using 1/2 the army to press directly on the near flank while the other half manoeuvred to pin the centre and far flank. Since there were woods and a marshy bit on the left I put all of the light infantry there, put the cavalry on the right and sent in the infantry, 2 brigades deep in the centre with artillery to either side. About 1/2 way through I had to make a second die roll to see if the plan was modified and this directed me to send the light troops on my left backed by any reserve around that flank of the enemy line since it was still holding. The first couple of turns were a bit rocky as I had proposed a return to the original 4,5,6 to hit rule which I had dropped a few years ago since it was too bloody. It soon became obvious that it was still too bloody and I quietly dropped the 4 apart from sharpshooters etc. I also realized mid-game that when doling out the light infantry, all single figures, mostly on sabots, I had meant to deploy 3 figures on a wide base as a "stand" with 2 per unit, capable of acting as independent units but having only small sabots on hand which were crowded with 3 figures, I placed them in pairs with 4 figures then immediately forgot that each pair of sabots was 1 "stand". So, in effect, I doubled the number of light infantry. Oh well, at least all of these things applied to both sides. Apart from that, it all went very well indeed. A tense game with some swings of fortune, some good tactical decisions and a few "shouldn't ha' done that" moments. 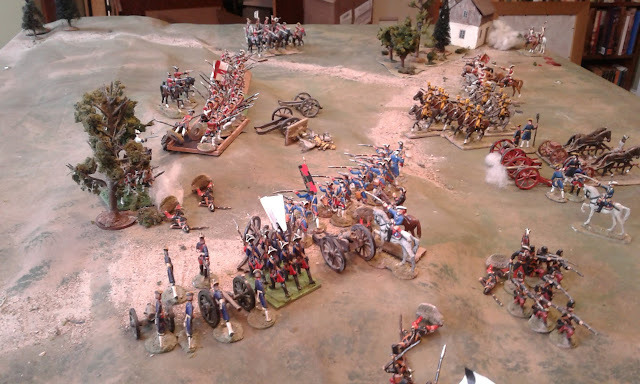 I had set my now usual 15 turn limit and while it was looking very iffy for Rosmark's attack by around turn 10, the order change allowing a left hook by the light troops who now outnumbered the defending light troops by 3:1 threatened to reverse the fortunes of the day. 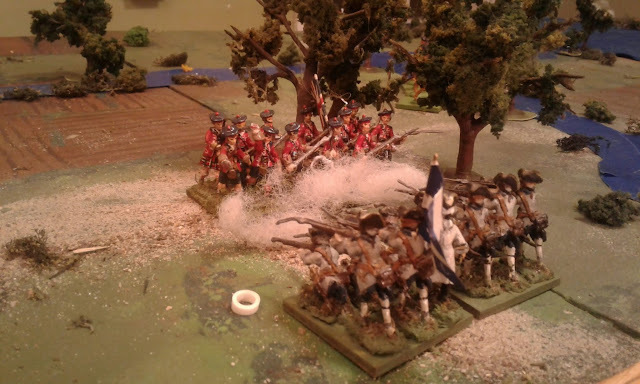 The additional pressure here and the weight of artillery fire had the Alliance starting to feel uneasy but the Rosmark Chasseurs suddenly seemed to run out of bullets while the Alliance ones finally found the range. A desperate all out assault by the Rosmark infantry almost turned the tide at the last moment but the battered remnant of the Old Brigade held and the Yellow Hussars twice refused an order to charge up the hill despite the success of an earlier charge, which had pushed back the white coats and overran a battery of guns, and the moment passed. I fully expected to miss the grid but the combination of larger, based, units and my painted measuring sticks in 3" increments was every bit as easy and managed a better ratio of weapon range to unit frontage without having to resort to 2 grid area wide units or doing away with all non-skirmisher musketry. The new version of Orders, something I have been tinkering with since the 1980's, finally worked the way I have wanted it to. Try, try and try again! What's coming next is still a surprise. To me that is. There is no "Ready for Paint" pool to draw on right now, just a choice between cast and assemble some new figures, cobble a partial unit out the various bits boxes or refurbish(yawwn) something, and I have yet to prepare a heated spot for winter casting. But it's -16C outside and there are various chores, mostly outside, which I suddenly don't feel like doing today, so, there is time for... well..something. Link to current version of Hearts of Tin rules. Basic: Units are 3 stands of infantry or cavalry, 2 stands of artillery or skirmishers or train. Light infantry and artillery may be split into 1/2 units. Single stands may be fielded as outposts or garrisons. Measurements are in “lengths” as selected for figure and table size. Standard units are 2 lengths wide in line. Initiative Deck. The game is designed to be played using a standard deck of cards to decide who goes first each turn and as “Chance Cards” which are amongst the oldest methods for adding a little uncertainty to wargames. Shuffle an ordinary card deck including the jokers then draw as many cards as the maximum number of turns to be played to make the game deck. Assign Black to one Side and Red to the other. At the start of each turn draw the top card. The colour indicates which player will go first that turn. If it is a face card then a “Chance Event” has happened to that player. If it is a Joker the turn is over and another card must be drawn. When the last card is played, the game is over. King: Getting the Jump. The player may choose one unit that may move or shoot or rally before the turn starts. The units may act again as normal during the turn. Queen: Angel of Mercy. The player may remove 1 hit from a unit. Jack: Confusion. The enemy may nominate one brigade or detached unit and issue it a valid order, rolling with a -2 to the die but ignoring all normal modifiers. If successful the unit may not be given a different order that turn but if it fails the unit may be ordered as normal. Ace. They couldn’t hit an Elephant. Pick one of your enemy’s commanders who is within range of one of your units and roll 1 die. On a score of 1 that commander is hit by a sniper or stray shot and is removed. Joker. Where does the time go? The turn is over. Pull the next card. The turn counts as having been played for things like the arrival of reinforcements and the end of the game but not for things like mining a bridge. Sequence: Active player issues Orders then moves OR shoots OR rallies units. Then resolve melee. Command Control: Generals and Brigadiers. The General cannot be everywhere at once but may intervene where it is important. He may move at light cavalry speed to attach to a Brigade or independent unit at the start of the orders phase. Brigades are 2-4 units plus Brigadier. Brigades and Independent units require an order to move or attack or to change their destination. Units in a Brigade must stay within 1 move of their Brigadier or within a base width a unit of their Brigade which is within command. Hold. May be assumed automatically when some orders fail or cannot be executed or may be ordered to stop a movement or attack before it is complete. Needs 2+. If failed continue previous order. Move. Needs die roll of 2+ Must have specific destination. If no route specified move by direct route. May not move within 1 length of enemy and the brigade will revert to Hold if the way is blocked. If it fails the roll go on Hold orders. When destination is reached go on Hold orders. If not playing solo it is useful to write down the destination and path if any. Attack. Needs roll of 4+ unless already on Prepare to Attack. Must specify target of the attack. Normally a terrain feature or position. Move directly towards the specified target and attack. If fail go on Prepare to Attack orders for next turn. Brigade/Unit may form to face enemy then must move forward. Artillery and Train units may not be given an Attack order. +1 if the General is attached. He must remain with the Brigade/Unit till next turn. -1 if General is attached to a different Brigade/Unit or is more than 6 lengths away or has no line of sight to Brigade/Unit or has been lost. -1 if the Brigadier has been lost. -2 if Brigade has lost 1/2 or more of stands and is being ordered to Attack. Movement: Measure farthest point moved. Change facing as required. Infantry: 2 lengths in line, 3 in column. Terrain. 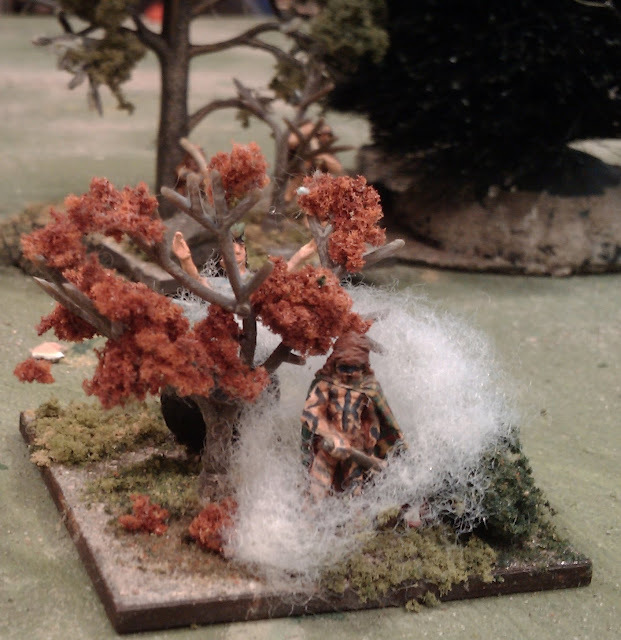 Generally each length across a minor obstacle or through broken terrain such as light woods counts as 2 except that skirmishers do not pay a penalty. Major obstacles and very Difficult terrain such as dense forest or buildings may only be crossed by infantry, light cavalry, pack artillery and pack train moving 1 length per turn or by skirmishers or by units moving in column on a road. Some terrain may provide cover. Some terrain may be impassable or have special effects. The nature of terrain features should be determined before the game begins whether all the players are informed or not. Shooting: Units within 1 length of enemy must resolve melee not shooting Test morale if stand lost. Roll 1 die per stand. 5,6 hits. Artillery within 1/2 range roll 2 dice per stand. +1 if artillery if shooting at column, square or enfilading. Combat.2 dice per stand of infantry, cavalry or artillery within 1 length of enemy to front. 5,6 hits. Where there is a choice of targets player may allocate dice as desired before rolling. -1 enemy defending hill, obstacle or cover. Commanders in combat. A Brigadier or attached General may choose to join a unit in combat. This decision may be made after the dice are rolled. He rolls 1 die. On a score of 4,5,6 the commander may inflict an extra hit on the enemy OR cancel 1 hit on his unit. On a score of 1 the General is hit and is removed from the game. It is presumed that someone will step up to take command but for game purposes there will be a -1 modifier to orders rolls for the rest of the game and the replacement has no effect on combat. Combat Resolution. Any unit which suffered more hits than it inflicted will fall 1 move and must rally on its next turn unless in square fighting cavalry. Test morale for every unit which lost a stand. If units remain in combat range test morale for any unit which lost a stand. If units still remain in combat range fight another round of combat. If units still remain in contact the attack must retreat. Pursuit. If cavalry attacks and forces all of its opponents to retreat on the initial turn of combat, it may advance up to 2 lengths and attack the same or a different unit. Morale. Hits represent loss of morale, fatigue ammo shortages, disorder and so on as well as casualties. Infantry removes 1 stand for each 4 hits, other units lose 1 for each 3 hits. Elite units may take 1 more hit per stand, Poor units take 1 less. A unit must test morale whenever a stand is lost. 1,2,3 Fall back a full move immediately, must Rally next turn. If desired it may defer the Rally and retreat a full move instead but it must rally or retreat before it may be given an order. -1 if Brigade at or below 1/2 strength in stands. Rally. A unit which lost a round of melee, failed a morale test or is on Hold Orders may Rally by standing still while adjusting its formation and facing as desired. If a unit which is rallying has hits carried over it may attempt to recover 1 by rolling 4,5,6 on 1 die. Hits cannot be recovered from stands which have been removed. It was late on that December morning when the morning fog lifted to reveal a Rosish army bearing down, not from the East as expected but from the South! 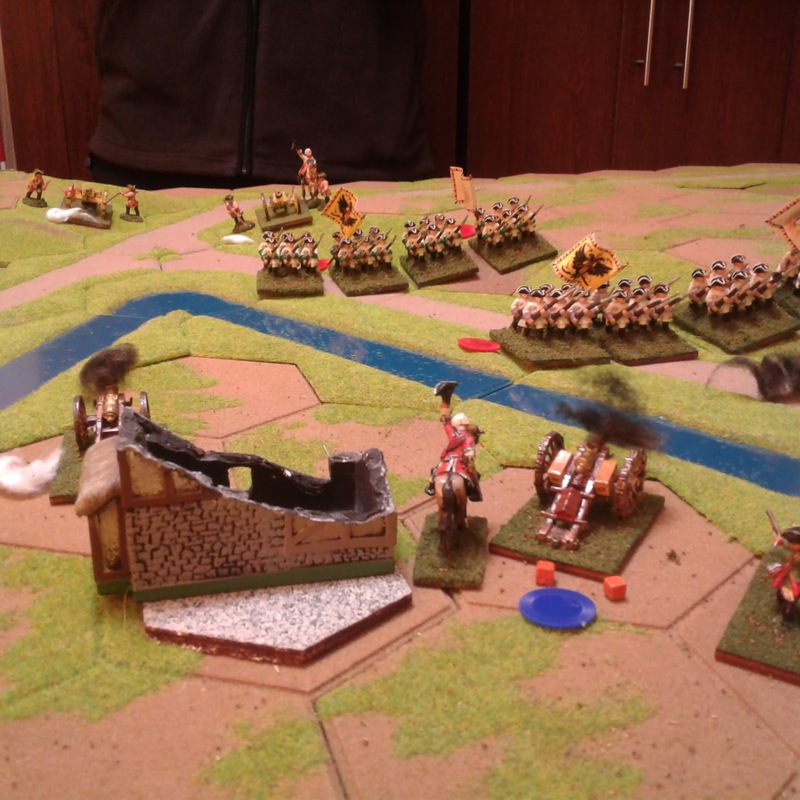 Alerted by a sputter of musket fire from the light troops guarding the flank, there was just time for the Old Brigade to wheel two battalions and the attached battery to face the enemy before the storm broke. The Foreign Brigade was slow to respond to orders but General de St Lambert had the Maritime Alliance army in place before the Rosish cavalry could exploit their surprise. It appeared that the Rosish general was not expecting such a swift reaction and the battle settled into a lengthy long range firefight. Eventually the Queen's brigade could take it no longer and fell back behind the Pandours. This seems to have stirred the Rosish general who sent the King's Carabineers to force a path around the far flank only to be repulsed by Fitzjames' Horse. The Pandours had as hard a time as the Queen's Brigade but eventually the fire of the Rosish artillery, Chasseurs and infantry told. The Alliance artillery was silenced and fell back but the veterans of the First Infantry stood their ground to the bitter end. If the Rosish infantry fell bravely without effect, their artillery and skirmisher fire swept the field. The Maritime gunners bravely poured their cannister upon the enemy infantry, holding them back but the enemy guns poured shot upon them and as their guns began to fall silent, the Yellow Hussars dashed up the hill, over running the last gun in B battery and forcing the Second infantry to fall back to the woods. 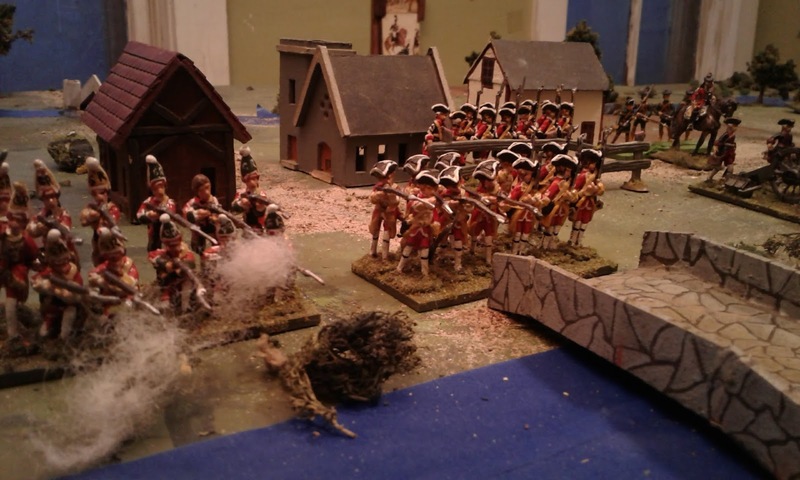 The flank appeared open and the Chasseurs, unable to brush aside the Volunteers guarding the extreme flank, began creeping up the hill until the redcoats of the Nordmark Naval Regiment appeared and, despite a hail of cannister and well aimed musket fire, cleared the hill at the point of their bayonets. The sun was setting low as this short December day drew near to evening and still the heights were denied to the Rosish forces. There was just time for one more assault by the tired Rosish infantry but it too was repulsed by the survivors of the First Brigade aided by the fire of the right hand battalion of patient Foreign Brigade. It was with relief that the Alliance forces watched the Rosish forces fallback covered by their remaining light troops. Time to get my newly based troops into action. The scenario is Weak Flank from CS Grant's Programmed Scenario. 1. Brigades and Detached units are assumed to be on "Hold" orders unless ordered otherwise. Orders will be persistent until carried out. Order change. Roll 1 die for each order change. -2 if no General is present. Hold succeeds on 2+, Move on 3+ Attack on a 4+ unless already Prepared in which case Attack succeeds on 2+. A result of 2 or 3 on attack order converts to Prepare to Attack. *errata: +1 if General is in contact with Brigadier, -1 if not within line of sight of General or if beyond 3 feet as the adc travels or if the General is in contact with another Brigadier. 2. Hold orders basically mean stay where you are but defend your position intelligently and change facing/formation, shuffle battalions etc within that spirit. 3. Move orders mean get from here to there (that is the order will normally include a destination), deploy as makes sense but no attacks. 4. Attack means move towards indicated position/enemy and, well, attack! Infantry & Cavalry units are 3 stands except artillery and Light Infantry are 2 stands. I've decided to post my thoughts on Dragon Rampant here. One play test is not much to go on but very few of the mechanisms are original, instead it is a clever blend of Old School and Current Fad with an original twist or two. I'm only going to give a very brief overview of how the rules work, there's lots about them on the net already. The play is normally igougo with one of those "first activation failure ends your turn" rules which are used in many contemporary British rule sets. This one has a nice twist in that failed rally tests and failed uncontrolled charge test failures don't end your turn. When a unit is activated it carries out all of its actions including shooting and charge resolution. There are no continued melees. Combat and shooting is unit vs unit so units can be composed of singles, multiple bases or even a single base. Combat goes the handfuls of dice route with hits modified by armour then morale if any hits are scored. Basic units have basic stats but these can be modified in various ways when building your army. My comments fall into three basic categories, "Like it", "Don't like it", "Hmm"
A1. The system is very flexible and encourages a narrative approach. Units are defined by the effect they have in battle, not by what they look like, so, if you can spin a story and pay the points then you can make your army anyway you like. For example, when I started assembling Hordes of the Things armies from old figures a few years ago, I made a base with a witch calling up a dense mist or fog from which is emerging a nearly naked, painted barbarian warrior. The rules had one category that worked but it had very limited uses. Here I had an option to pay to make him invisible until he attacks. Sounded perfect until I read closer and found that it only protected him from shooting, great vs some armies maybe. Instead I could have used the magical mist as the equivalent to "shiny armour" to make him harder to hit, if I hadn't run out of points! My old prePB range, nearly naked, tattooed, Minifig Pictish archers, kneeling with their tartan cloaks pulled over their head on the other hand, fitted the "Scout" class to a tee! A2. Quick and easy. It should be easy to teach at a convention and a series of unit cards or a one page Cheat sheet with rules and army list and a 5 minute intro should be enough to get players going. A3. Dicey! The combat results would be easy to predict if dice were dependable but the handfuls being thrown mean that, like in Charge!, low probability results can almost never be ruled out so even a "sure thing" can go south. However, it also means that most combats will tend towards the expected result if there is a large advantage on one side. Keeps everyone on their toes while encouraging sound tactics. A4. Clever. The unit stats and special magic etc attributes are well thought out and once learned will do a good job of encouraging troop types to be used in an appropriate way for their type. B1. I HATE first failure ends the turn activation systems. From a theoretical point of view they do a piss poor job of recreating how historical armies are run and commanded. From a practical point of view, I have played too many games of this system where one side went turn after turn without being able to do anything. It wasn't fun for either side and in most of these cases it was against friends I only rarely get to play against. In one case we got smart, reset the table and played Charge! which saved the day. In my play test my prejudice was immediately aroused when after 4 turns only 2 units had been able to move, both sides combined, but luckily it got better. B2. No Command function. Yup, the commander doesn't even affect the activation rolls. They do have a cheerleader function though which is to say they give a minor morale bonus to nearby units. C1. Massed Battle lines are prohibited. No unit may come within 3" of an enemy unless charging. I'm OK with that, but also, no unit may come within 3" of a friendly unit. What!?? Yup, you may NOT form a cohesive battle line. Not only is it awkward to implement in play (I cut out a little 3" square no-go forcefield template but even it was hard to use.) but flies in the face of usual shield wall or phalanx fantasy battle formations. I suspect that it was designed to avoid having to write a rule saying all charges are one unit vs one unit and so on but it weird and requires a bigger table for a small force than would otherwise be needed. Anyway, my Scottish schiltrons had to be formed somewhat like Republican Roman legions in chequerboard formation. It would probably be less noticeable if using 40mm units on a 4" or 6" frontage. Anyway, in a fantasy game its not really a big deal but it would bug me in an historical setting. C2. No flanks or rear. Or to put it another way, its as easy to charge or shoot at a target behind your left flank as it is to do so at a target to your front. Presumably the low level of the game means the individuals can turn quickly and without worry for formation but given the trouble most units have in walking straight forward without chewing gum, its just as well they can automatically spin about like tops when charged. C3. Points systems! I used to love playing with these but these days I hates 'em and loves 'em all at once! This is not a theoretical objection, but is based purely around the amount of time I wasted trying to get the exact right point score while best capturing my vision of the various units. C4. The Theoretical Scale. Yeah, who cares but its supposed to be 1:1. Since bowshot is only 18", which would suggest about 1" to 10 yards at least, this suggests a scale of at least 5, if not 10, men per figure for humans making an infantry unit something like 60 to 120 men or a very reasonable small company. But groups of 12 spearmen, forming a defensive shieldwall? Really? OK back to who cares what the theoretical scale is, just play the game and think about the storyline. Will I use them for my Prince Valiant game? Maybe, probably. Will I use them at home apart from training for Huzzah? Not likely. Would I play them with friends who wanted to? Sure. Tuesday's game was Crossing Point from CS Grant's Programmed Scenarios. We divided the army point values by 50 to get the number of Portable Wargame SP's per army then used the suggested lists as a guide. 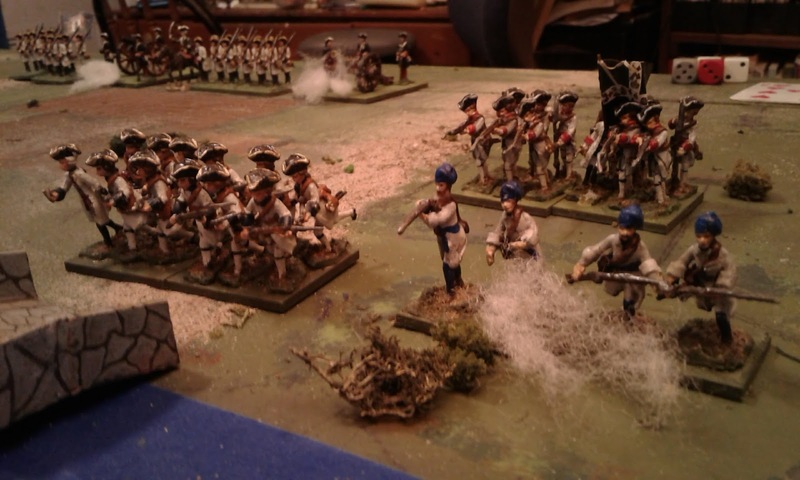 We made one change in the rules, we shortened Infantry musket fire to two hexes. Light infantry remained at 3. This seems to have allowed them to better perform their harassing task and made them less prone to having to engage in firefights with superior numbers as their only tactic. That made Ron the attacker with the Austrians. 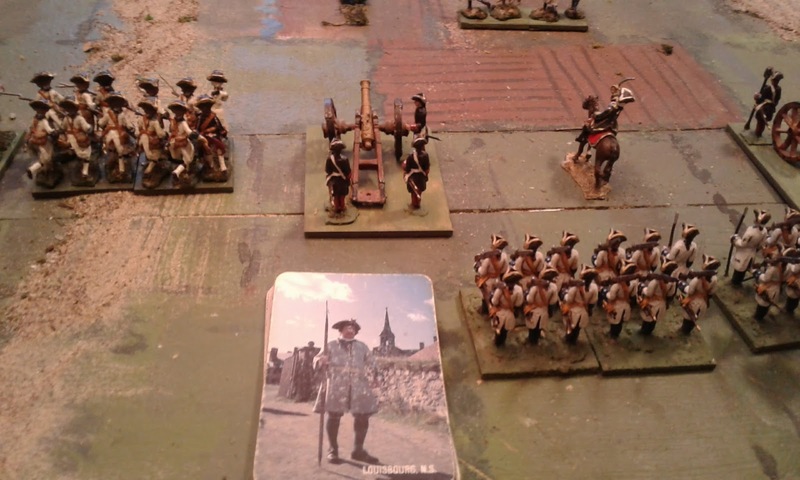 He chose a list with 1 light cavalry, 1 medium cavalry, 1 light infantry, 10 infantry and 2 guns for 49 pts. (Exhaustion of 16) Then he had to roll to see if he marched on using one road or two. Luckily for me he rolled up 1 entry point. His mission was to establish a substantial bridgehead on my side of the river. We set a time limit of 15 turns. Ron is not usually an impetus commander and he decided to deploy all of his army before making any serious attacks. In this case however, having to arrive by one road meant that the game was half over before he was in position and he had been so busy avoiding unnecessary casualties that he hadn't inflicted many either and the river was still between us, the primary defences still intact. Once deployed, he pressed forward, pausing to silence my guns so they couldn't enfilade his infantry but that took time too and my light infantry had moved into position to snipe at a range where they were safe from return fire. At this point it became obvious that he had made an error in laying out the terrain, the folds in the river were far too deep, making the approaches to the bridge too narrow and too enfiladed. None the less it was what he faced. Now I am a fan of de Saxe and Suvarov and given the narrow space and short time, I'd have massed my infantry and gone in with the bayonet, full speed, packing my units in two deep to prevent the forward ones from retreating. Might have been a bloody but glorious defeat or I might have pushed him back and forced my way over the bridges. We'll never know. What Ron tried was a slow advancing fire fight, making sure that all units could retreat if needed. 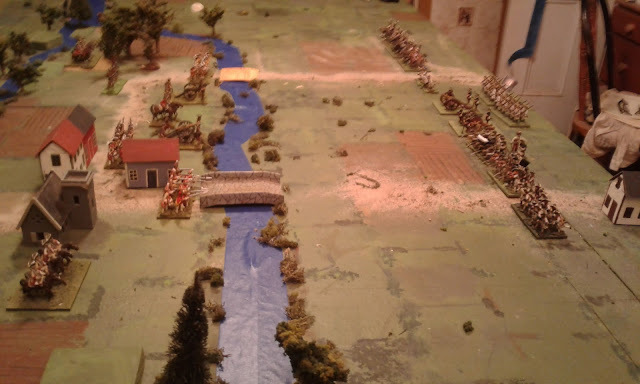 Unfortunately, due to the narrow frontage and the fact that I could enfilade him from across the river, my units ended up inflicting twice as many hits as they received despite being outnumbered 2:1. Worse than that for Ron, the fight took a very long time with little to show for it. A dash at the other bridge by his cavalry had some success but each time a counter attack drove him back. The battle winds down. My counter attack against the near bridge has resulted in both sides falling back but he has yet to cross a bridge let alone establish a bridgehead. At last when time was up neither army was exhausted but he was 3 SP's away and I was at 4. I only needed to hold however and in that bottle neck he needed a lot of time and he didn't appear to have enough SP's to allow him to push across the bridge even if we'd had more turns to play. After the game we took the big loop out of the river and Ron may just play it over again solo. I'm quite content with the victory as it was. Why I haven't finished the DR report yet. Too busy playing the Portable 7YW! Warning: The battle report is not for the serious of heart. Its only 5 months until Huzzah! 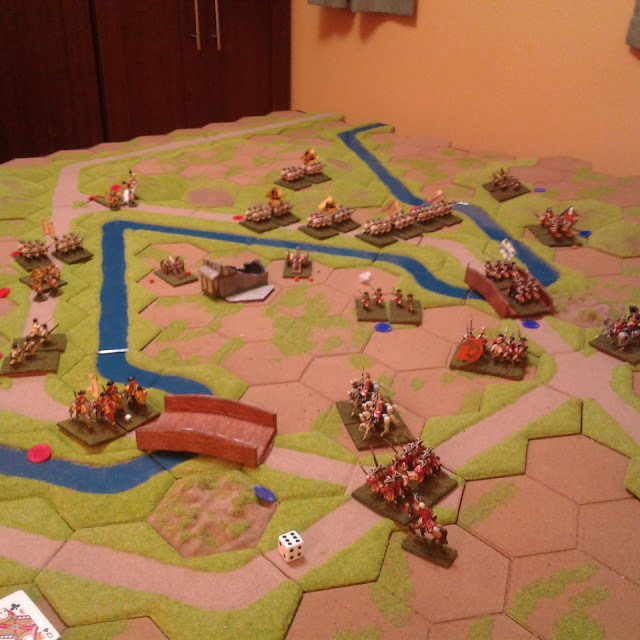 Rob and I have started talking about the multiplayer 1/72 Dragon Rampant game he will be running at Huzzah. I will be assisting to GM the game so I decided that I'd better get a copy and bone up. Dragon Rampart about to be tried. 25mm Garrison, Minifig, Ral Partha, Revenge and Prince August miniatures. It also occurred to me that it might be a good thing if I could make the rules work for my Prince Valiant game as well. Its a popular set so will possibly attract more players, I won't need to keep two sets of medieval skirmish rules in my head during the convention and I won't have to spend the time and mental effort developing a set and then have to learn both over the next few months. That will give me more time for painting and working on the scenario for my game and terrain not to mention more time for other games. Time for a learning trial game. The armies laid out are from my Gathering of Hosts blog and a report on the test game will be posted there in a day or so. Well, I tried. I started with my old French units which had never been mounted on washers. Soon each 20 figure unit had been reduced to 12 figures with the stragglers mingling in search of new partners with which to form new battalions. It was a rather sad sight really, more than 15 years of tradition banished by the heartless economies of officials. Just an old softie, that's me. They won't fit properly on the grid but I'll still have room for some new units, conversion back to Charge! will be easier should I ever need it, and I have been contemplating dropping down to a 4'x4' everyday table with an extension to 4'x8' anyway. Nature with its usual sense of humour dumped 40 cm of snow on the city the next day as relief efforts were getting into high gear. When we last saw my Prince August 18thC figures I was excited but deadlocked and put them away to simmer in the background until I found a satisfactory solution. Well, six months later, they have come to a boil. Flagged and based for Battles. a) I want each part of my collection of toy soldiers to provide a different gaming experience and to be used. b) I wish like crazy that Prince August had done almost anything other than more Tricorne troops, but I wish to support them buy buying and using their new range of moulds anyway. c) I wish to maintain a Prince August contingent for Charge! games with the HAWKS but don't have room on my table at home, or a need at conventions, for more than what I already have so it doesn't really make much sense to me to just keep adding more of the same to my Charge! collection hoping that once or twice in my life I might once again get to use more than a fraction of them all at once. 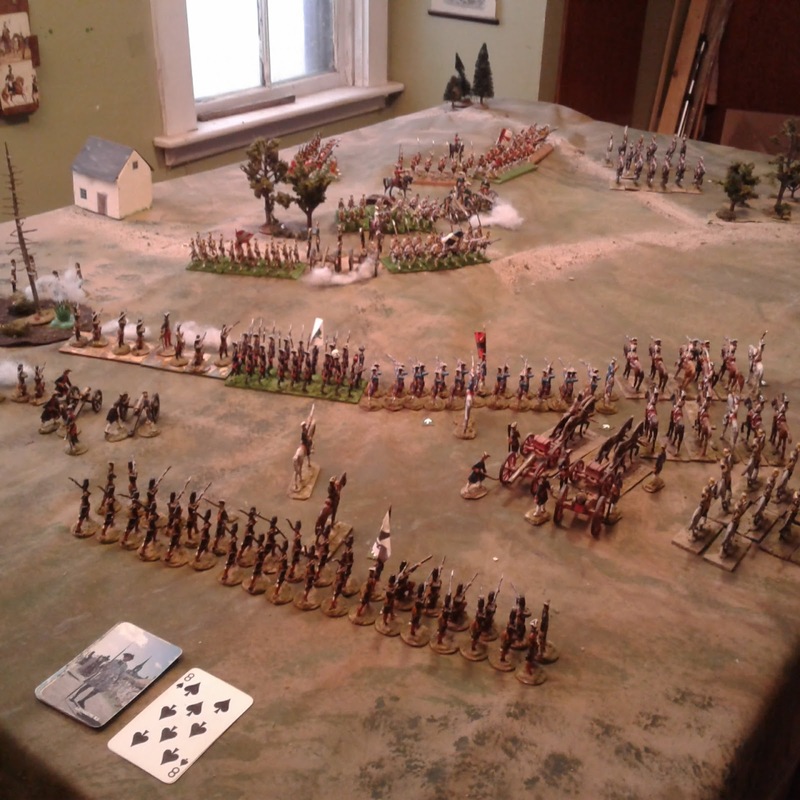 My next idea was to use the new figures for Seven Years War in North American games but there is just too little difference other than uniforms between musket era games in North America from 1755 to 1814 to justify the duplication with my War of 1812 collection. 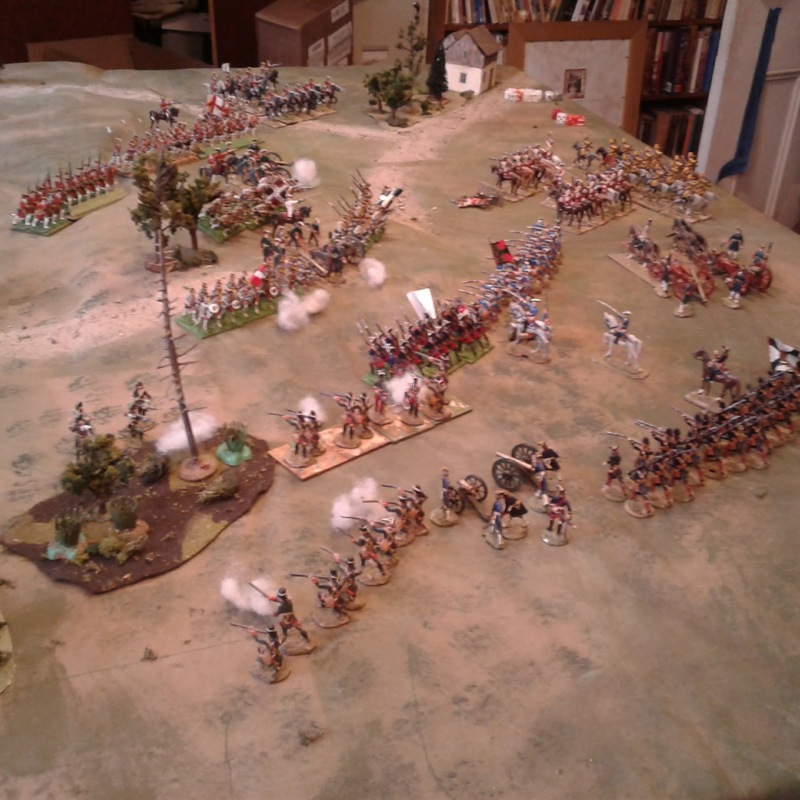 However, one of the things I lack now that my 15mm French Revolution armies are gone, is the ability to stage Horse & Musket era pitched battles involving a substantial proportion of said Horse. Once the new cavalry figures come out, hopefully this year, the Prince August figures are my best source of figures to fill that gap but it can't be done to my taste on my existing table using full Charge! organization and 1" wide bases. The alternative that I had been thinking of was to go off grid and field each Charge! Company/Squadron as a battalion/regiment under a new set of rules. This would allow them to remain available for Charge! games while providing something slightly different from any of my other games. This was the option that I successfully tested in June. However, the last game at Ron's has been in my mind. The units were small and the table not crowded but it still felt more like a battle than a skirmish and reminded me of my old 15mm games. Chubby Minifig 25mm figures on Hexon terrain. Well, the semi-flat Prince August figures are taller but not broader than 25mm Minifigs and the same number of infantry and cavalry figures can fit in a 4" grid area and allow me to pack enough units on my table to offer myself a different feeling game. Over the last 2 days I've been comparing the pros and cons of the two options and what the difference would be in the probable feel of the games and in the shelf & table space requirements per figure. It was a hard decision, heart over mind, but I've decided to go for more smaller units on the grid rather than fewer larger units off grid. So now, a new set of rules to develop!